Medical Assay Laboratory is a full service, privately-held medical testing laboratory incorporated in the state of Illinois. We specialize in providing high-quality clinical laboratory services to Physicians, Hospitals, Home Health Care Agencies and Individuals at an affordable cost and a quick turnaround. We also specialize in contract laboratory services for corporations, colleges and schools, and county and municipal governments interested in drug screening. Our process is quite simple. First, physicians and other health care providers can send us specimens from anywhere in the United States (see guidelines for shipping specimens). If you are a health care provider located within 100 miles radius of our facility in Suburban Chicago, in Westmont, Illinois, our couriers will pick up specimens directly from your office or practice site. Second, individuals with a prescribed test or those interested in monitoring their health may contact our facility to have a specimen collected. If you visit our facility, a team of highly trained medical technologists and phlebotomists will explain to you the test to be performed and provide you with educational material prior to collecting a specimen. 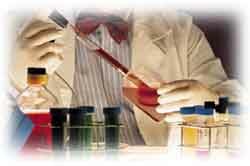 Third, completed analyses are reviewed by our board certified physicians. Test results are immediately available and can be faxed or dropped off by one of our couriers. Through our dedicated information technology network and the internet you may access your test from our web site using a secure (encrypted) and authenticated user name and password. Original test results are sent by mail directly to you. We pride ourselves in our ability to provide you with STATS results the same day we collect or receive the samples.